Blackbird (Turdus merula). Male. Taken Abingdon, Oxon., on February 1st 2019. Male. Taken Abingdon, Oxon., on February 1st 2019. Blackbird (Turdus merula). Female. Taken at Otmoor, Oxon., on January 30th 2018. Female. Taken at Otmoor, Oxon., on January 30th 2018. Blackbird (Turdus merula). Juvenile. Taken at Abingdon, Oxon., on April 4th 2008. Juvenile. Taken at Abingdon, Oxon., on April 4th 2008. Male Blackbirds live up to their name but the females are mostly brown, often with spots and streaks on their breasts. The bright orange-yellow beak and eye-ring make adult male Blackbirds one of the most striking garden birds. 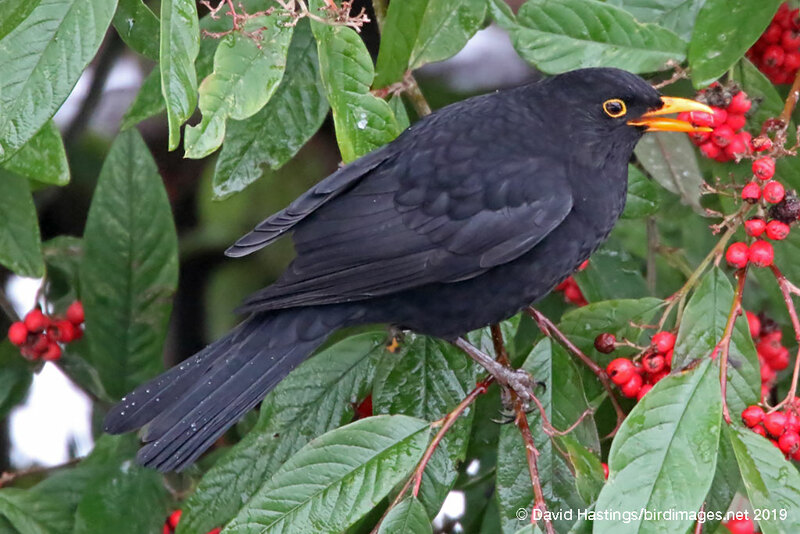 Blackbirds can be found throughout the British Isles. They breed in woodlands, parks and gardens. Usually two or three broods are raised each year. Blackbirds hold territories from late autumn to the end of the breeding season, which are vigourously defended against intruders. There are about 5 million breeding pairs in Britain. The winter population may rise to 15 million birds.